A nomogram is a a graphic representation that consists of several lines marked off to scale and arranged in such a way that by using a straightedge to connect known values on two lines an unknown value can be read at the point of intersection with another line (Merriam-Webster Online Dictionary). This nomogram for assessing death risk of deferred treatment of prostate cancer is based on data from some 1900 British men. These men had prostate cancers diagnosed in the early 1990s by needle biopsy or TURP, no initial treatment, and a follow-up for at least 10 years. 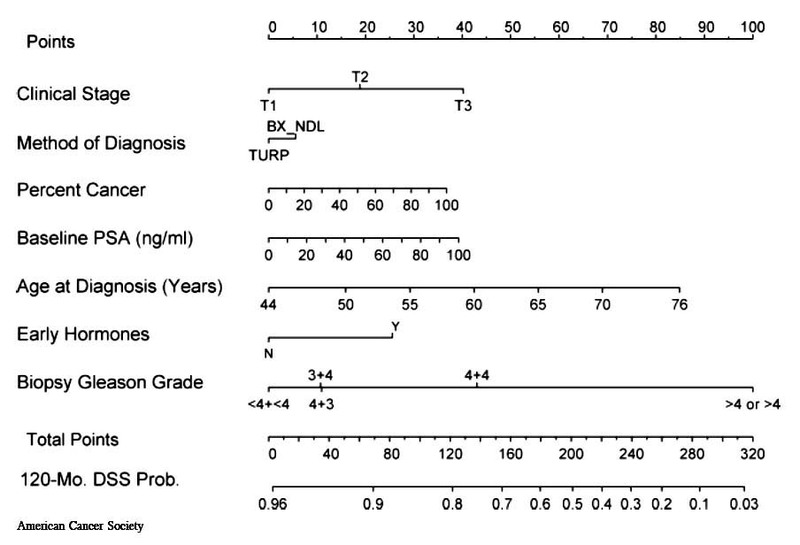 Median age at diagnosis was 70.4 years; median PSA at diagnosis was 15.4 ng/ml. High-grade disease was present in 42% of the men. Specific patient examples, where the Kattan nomogram is applied to predict risk, are given here.